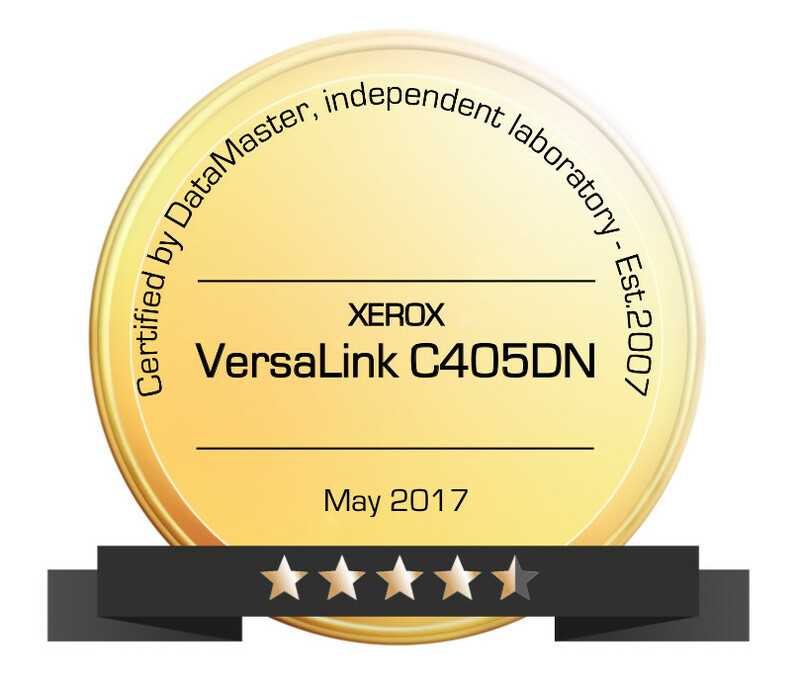 The Xerox VersaLink C405DN Color A4 Multifunction Printer has been tested and evaluated by the DataMaster Lab team. It has been awarded 4.5/5 stars by our laboratory. The touchscreen interface of this MFP was particularly appreciated. The interface and driver are truly intuitive and easy to use. This machine is very productive: no loss of productivity in multi-task / workgroup mode (simultaneity on printing and scanning, and it retains speed when sent 15 print jobs at a time); the RIP time observed is Very short for a machine of this segment even when confronted with multi-layer PDF files and heavy MS.Office files in automatic color mode. It intuitively displays linked networks, and provides easy access to shared folders without requiring the user to have significant IT skills. Connectors to the Cloud and the ConnectKey application suite are also convenient and user-friendly (including Capture Point that allows you to OCR scans to an Office format). Finally, the quality of printing is very good, especially as regards contrast, resolution in general terms and on small black characters on white background. The evaluation certificate and the corresponding badge are available for download from our public site Printer-Bnechmark.com, or from your DMO portal under the Laboratory tab. The radar chart, detailed results of productivity tests and other comparison tools are only available on the DMO portal.